Luxe Pens There are 2 products. Exclusive Luxe design features intricate diamond etched pattern emblazoned on bottom barrel, with shiny chrome upper barrel to expertly frame company logos. Pen includes premium black ink cartridge. 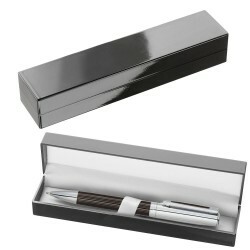 Luxe gift box included with LUXE logo foil stamped on inside of lid. Engraves Champagne. Blackening is an option. Exclusive Luxe design featuring double layered lacquer detail accenting subtle pinstripes on lower barrel. Shiny chrome upper barrel and colour fill clip accents complete design. 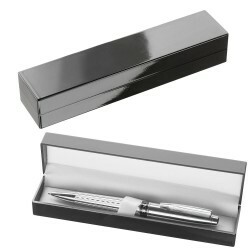 Pen includes premium black ink cartridge and Luxe gift box. Engraves Silver.